We’re hopping to a different country this week for a special drama spotlight: In Time With You, a popular Taiwanese drama that just became available for streaming earlier this year. While it’ll feel familiar to drama fans, it’s something a bit different. In Time With You is the story of Cheng You Qing, a successful career woman in Taipei. On her thirtieth birthday she makes a bet with her best friend Li Da Ren: they’re going to try to get married by the time that they’re 35, and the first one to get married receives a special red envelope present from the other. It seems in some ways an eye roll-inducing setup; the primary story to be told about a successful woman revolves around a silly bet she makes to find a boyfriend or get married. But despite that sort of being the premise of In Time With You, the show does its own thing. 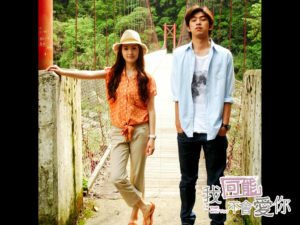 Taiwanese dramas tend to be less concerned with zipping through storylines. Sometimes that leads to boring moments, but other times it allows us to revel in characters and their development. That’s the case with In Time With You. For all that it’s the given summary of the show, we really don’t hear much about the red envelope, aside from a few scenes and some passing references. Instead, In Time With You is really about You Qing and Da Ren navigating their professional and private lives. A bigger thread through the whole series, rather than the red envelope, is You Qing’s list of the signs of a professional, successful woman. She’s confident in her career, determined not to settle, but she’s also not interested in climbing the corporate ladder. She wants to balance her professional life with her private; we see her both vulnerable and strong in professional and personal senses. It makes You Qing one of the most relatable drama heroines I’ve ever watched. If the story is about anything, however, it’s about the slow, slowwwww burn romance between You Qing and Da Ren. We jump back several times to when they met in high school, and in those flashbacks follow their friendship through the years up until when the drama takes place. In Time With You wants us desperate to see You Qing and Da Ren together, but it’s not in any rush to get there. That’s in part because the show isn’t in a rush to get anywhere. But it’s also because it’s one of the few dramas I’ve seen that really takes the time to explore how tricky it would be to negotiate a romantic relationship into a best friendship that’s spanned nearly two decades. That leads to slow realizations, a whole lot of sweetness, and an almost unbelievable amount of pining. Because the pace in In Time With You is so relaxed, we really get to see and understand why our leads work so well together. We see them on their own and with other people, and in their familial and professional lives where romance doesn’t (always) factor into the equation. We also get a lot of great development of the secondary characters. The less said about You Qing’s relationship with Ding Li Wei the better. The only good thing about it is that, in many ways, Li Wei is the typical drama male lead. But in this case he’s the second male lead, and the drama pulls no punches about how scummy he can be. Although I found Nic’s — another love interest for You Qing — actions far more despicable than the show seemed to — the guy plays cute and then sleeps his way up the corporate ladder, which is only fine when both parties realize what he’s doing, and in You Qing’s case she didn’t — I liked that it made him a three-dimensional character as well. The secondary romantic interest that really stands out is Maggie. I didn’t really want her and Da Ren together; it was so obvious Da Ren wasn’t that into her, despite trying to be and not wanting to hurt her. But I liked Maggie, even though sometimes she seemed deliberately obtuse. She got to shine the most after breaking up with Da Ren, and her character growth was almost as good as You Qing’s. One of the best relationships in the show, however, is between You Qing and her parents, her mother in particular. I’m so used to hating the families in dramas; even the heroine’s family often gives her troubles. In You Qing’s case, her parents are sweet and supportive, but they also act like a real family. They nag her, tease her, playfully gang up with Da Ren against her, don’t always take her seriously, but are always, always there for her. The real appeal of In Time With You is of course You Qing and Da Ren. They are adorable no matter the iteration of their relationship. The show is perfect for anyone who’s interested in dramas, and hours of a cute, fluffy relationship, but doesn’t want all the dramatics that often come with kdramas. That’s not to say that nothing happens, but In Time With You is another drama that’s not made for constant back-to-back episode marathoning. Trying to do so can make it drag a little bit, whereas the show really ought to be watched it its original format (a few episodes a week), or at most, an episode a day. There’s enough going on in You Qing and Da Ren’s everyday lives to entertain at that pace. And it’s certainly refreshing to watch a drama that brings as much cute as the most popular kdramas (or in my opinion, more than many of the most well-known kdramas) that doesn’t employ melodramatics. Because the focus is on You Qing and Da Ren’s development as adults, they have one of the most equal relationships in dramaland. There’s no arrogant male lead yelling at a meek heroine, or following her around (again, we have Li Wei, but the key is we’re supposed to think he’s a jerk). Da Ren pines with the best of them, but he also shows us just why he’s good enough for You Qing. He loves her, is always there for her, and always treats her with respect. They don’t always agree and have plenty of fights, but they have a healthy, balanced relationship. That makes In Time With You the perfect gateway into Asian dramas, or the perfect drama for someone who just wants to casually watch a fantastic show. You can stream In Time With You from Hulu or Dramafever.